Forthglade Complete Meal Grain Free Dog Food is a nutritionally complete diet made with a grain-free recipe particularly suited to dogs with sensitive stomachs and/or food intolerances. Containing Sardine as a good source of protein that is easy to digest and highly palatable, Forthglade Complete has also been packed with essential vitamins and minerals to ensure your dog gets all the nutrients they require. 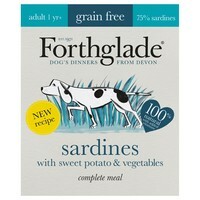 Forthglade Grain Free can be enjoyed on its own as a complete meal, or used as a tasty topper for a good quality dry food.